From Seven 20. These barbeque tools are made to last whether you are using them for camping, tailgating or a patio party you will have quality grill tools for years to come. 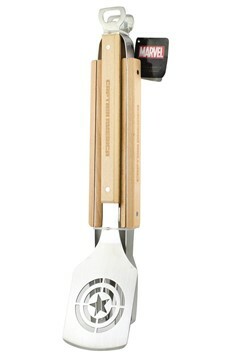 The sturdy wood handle ensures your hands stay cool and high-quality, 304 grade stainless Steel 3 pc Captain America BBQ grill set will make any grill master smile. The set includes a large spatula, fork and a Wide tong tip for secure handling of your food. All with a bottle opener feature which you can use to hang your tolls as well. strong fork. The 17 inch length keeps you far from the flames..